Wow, the holiday season is over and just about all the Football Bowl games. If you’re like most folks, there were too many to watch or even keep up with. But even if you just watched a couple or maybe you focused on professional football, there was a common theme heard this year in all the game commentary, interviews with coaches & staff, and even from the players themselves: “player development” is key to a successful team longer term. So how does “player development” relate to learning & development? Well, it’s practically the same…or at least it should be. When you think of player development in terms of a football team, it’s the notion of ensuring everyone can play their position. Here’s how most describe it. Ensure each position (i.e., job) has a set of expectations around performance and skill needed. Without a clear set of performance expectations how can you know when one is doing their job well and where they need to improve? 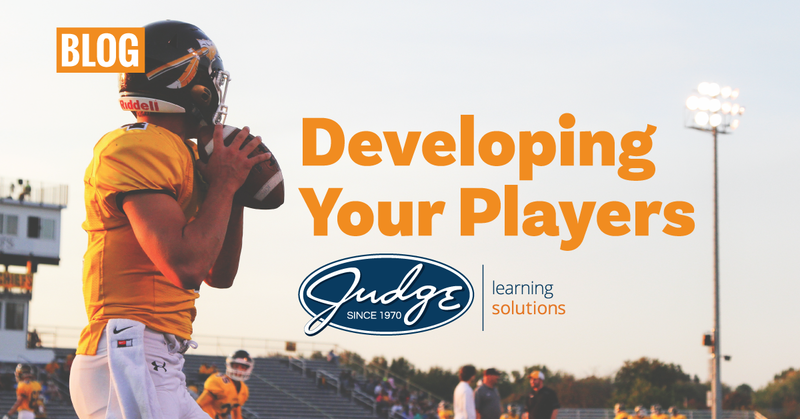 Just like a football player, employees need to know what the measurement is for their performance. While this is not an L&D responsibility, it is helpful for L&D to know what behaviors are expected so development can be geared toward achieving a level of proficiency and, in turn, success. Ensure the fundamentals are there. The basics need to be place. If someone cannot do the fundamental aspects of their job, then there has been a recruiting error and you may need to backtrack. Same with employees. If you hire or promote a person without the fundamental capability to do the job, then the employee will struggle and possibly get cut. L&D can help organizations when they want to test or re-train employees on the fundamentals. Provide the experiences / training for them to get better at their position. Just like on a football team you need to continue to train to get better at your position. This means getting chances to perform the task and demonstrate your skills repeatedly at the same position. Some might call this “practice” but in the corporate world, it’s being able to perform the job over and over again and in different scenarios until you reach the best performance. Allow them to fail during practice and coach them when they do. Football players need to take certain risks in performing their position. Sometimes this is to see what works and what does not work on the field. Employees also need an environment where they can safely take risks and be coached later as to how to mitigate those risks. L&D can ensure that this is built into learning assets intended to drive better performance (i.e., not just inform). Coaching them after rather than just evaluating them is key to helping avoid repeated failures. L&D can ensure that “coaches” are prepared and have a script to follow. Make opportunities to try out new positions. Just because you recruited a player to perform a certain position does not mean that they cannot be widely successful in other positions. Allowing players to try out new positions is important to their development as well as the team’s ability to know who they can flex into “vacant” positions when needed. Same for employees, to truly develop and prepare them for either a lateral move or a promotion, there should be opportunities to play these roles while continuing to perform the current position. Again, L&D can help in ensuring that just-in-time learning, microlearning, or access to outside learning is available to help employees get ready to try out a new role. There are probably a hundred more ways in which we can develop our “players” to be better performers. But the question is how many organizations are using the development tactics above.